@Catija AFAICT there is no documentation on MSE or MSO that the code filter is SO-specific. In addition, there are quite a few open questions on MSE asking about it that were posted prior to the MSO-MSE-split. Thus, I'd say it's reasonable for the OP to assume that the post is "inappropriate for MSO rather than MSE". Five people voted to close that question. @Catija Didn't you tell me once that I shouldn't direct my messages and comments at users? Didn't you just do the same thing here? I'm really not following you. @SonictheAnonymousHedgehog Could you say that in a way that doesn't read like "You f-ed up, do better next time"? I don't see how that relates? I was specifically unhappy with the tone you chose to take with me when criticizing people. You're the one criticizing me... again... and I'm saying that I don't care. Why aren't you telling @ShadowWizard or one of the other three people who VTC that question? @Catija I'm actually not criticizing anyone, or anything...sorry if my messages above came across that way. I was just asking a question. And, again, I'm not going to bother the CMs with a myriad of "can you migrate this Plz" flags. I get them all the time on IPS and they're usually declined. You pinged me in here and on the question. That seems a bit excessive. After reading the two messages above, I figured that the second one would come across as criticism, so I addressed that one specifically. I still couldn't see how the first one would. @Catija I just wanted that one reason to show on the question, and tell you the rest in chat. Coffee understand. coffee does not ask silly question. Why are you reporting that @Ano It's not spam. also, why does that need to be on smokey? Please don't use Smokey to report NAA. Flag it on the answer or move along. Nobody understands me like my coffee does. Still not a reason to use Smokey. Smokey is for spam. @JourneymanGeek It's an obvious trolling attempt. never attribute to malice, what could be attributed to incompetence. and its unlikely OP will keep posting "coffee understand..."
@Rob That's impossible... Unless they deleted their account and recreated it? Maybe? Dunno... the account's only two days old. Regular badges (unlike tag badges) are not revoked. Coffee isn't even as old as some of those badges are earned on dated. @Rob I don't see any badges? If a post gets deleted, or is downvoted below the badge threshold, you keep the badge. But Coffee didn't exist in 2009. And the inconsistency is a bug. Or everything about that profile is a bug. @Rob Could you write up a bug report on MSE? I don't see any reason for that. @Rob Ah, yes, I see the badges now. I just wasn't looking in the right spot. Yeah, gone for me too. Still worth putting it up on Meta, @JonEricson? Yeah, I have one, too. @Rob I think it is. We might immediately mark it as norepo, but it might help if the bug comes back. Considering the SFF thing... maybe it was mis-matching results to the pages... SFF gets SO tags... this user gets someone else's badges. Quantum badges exist only when they are not observed. We looked at them and collapsed their wave function. Looks like it's related to this. Maybe Marc kicked the servers a bit too hard? And badges scattered all over the place, ending up with random users. Reports blocked for 1 seconds in room 111347. A very short one, too. Brevity is a virtue. @quartata Sure, and you shouldn't worry about the giant S I happen to carry around. Reports blocked for 2 second(s) in room 111347 on stackoverflow.com. Looks like Nick needs some tools for automatic update of build tools. And preferably, a way to update those, automatically. The relevant info has been edited into the FAQ, so this is now a dupe. @FTP I guess one of the command involves kicking the server. @SmokeDetector Too long reasons for a short title. @HTTP It is ALL THE BADS! ALL. THE BADS! BADS! ALL! @Catija Again, I'd like to apologize for the tone I used in those messages. After having reread my messages, I see where you are coming from. @ShadowtheHedgehog I also mod-flagged the question requesting that the comments be cleaned as they are just unrelated meta-discussion. @Ano it's the top one for me. I just tried it. Even changing all the sort and it's still at the top. @HTTP Figured out. Blame SOUP. @ShadowWizard The one you just used Chaos Control on. @Ano it is, you're either on "oldest" or "active" sort, not "votes". @Ano uninstall SOUP, since you're really active it's going to give you lots more of those. It's changing the behavior of the sites on purpose so of course you'll be confused. @ShadowWizard I've just installed it to fix one bug that's bugging me...that said, I'll take care to disable SOUP before reporting a bug to see if SOUP causes it. Thankfully I didn't ping Shog. @Ano waste of SE staff time... it's just comments. There are thousands, maybe millions of useless comments on MSE. If SE staff will have to clean them all up, they'll work on this 24/7 for 100 years or so. Not a good idea. And actually the comments aren't 100% useless, they explain the process of closing the question as duplicate. Personally I'd decline the flag to delete them. @Ano yeah but you'll surely encounter lots more of those "hey, this doesn't work" or "hey, behavior changed", so don't forget to disable SOUP as first thing. Next: a browser extension "Am I losing my mind!?" that will open the same website. In incognito/private mode. @ShadowWizard As I said before, one should be pretty careful when using such words to describe a fandom, since they often carry very different meanings for different persons. To be more specific, that term is mostly used with a negative connotation. @Derpy I lost you. What words exactly? "like"? I start to think it's better to leave you alone since you see any word as negative. I just said "I think [someone] will like [something]". How can this be negative??????? sigh. @ShadowWizard Yep, sorry. Probably it would have been more clear if I replied to Rouge instead, but what I meant is that I would prefer to not be associated with the term "furry fandom"
@Derpy only @Rouge is furry, not you. But since you try to turn her into "your side", think it's just fair she's trying to turn you into "her side". Even though I didn't find any negative meaning to "furry fandom" I'll not use those words while mentioning you any more, after this very message. As now, I am not even sure I would want to use the term "MLP fandom" since there are also people that think that cupcakes is a fandom work. @ShadowWizard that's probably because the meaning you give to that word is far less negative that the meaning other people give to it. Even on this chat. This is the reason I was suggesting to be careful with words. @Derpy words are just words.. one can either say them or not say them. I'll not say the "f" word (ending with "dom") any more when replying to you or mentioning you in any way. I honestly didn't know that word could have negative meaning, so I'm sorry. Relax... it's a cultural difference... and something that "you know it's bad when you know it"
@ShadowWizard it is not the word "fandom", it was the other one. Again, don't worry, it's not like I am angry or anything. I just don't want other users start posting jokes that could easily escalate. Q: Can We Have Auto Removal of Election Candidate? @Shog9 Since you implemented the feature to disallow candidates who have been suspended in the past year, pinging you. The feature is a script checking for prior suspensions, but there are edge cases. Some suspensions are reversed. Maybe this one is unjustified, who knows. Magento is an unusual site. 20 candidates already. They should share some with sleepy betas that can't find any. Also, they don't like comment flags. I got more declined flags on Magento than anywhere else, by a wide margin. Marius is a notable mod. @OptimusPrime also his location changed from Mandaluyong, Philippines to Baltimore, Maryland. @ShadowWizard noticed that too. But don't know where Maryland located. @ShadowWizard Can you delete this answer? For reasons of public reputation, I need to delete the question. @ɪʙᴜɢ public reputation? Sorry, please be more clear. @ɪʙᴜɢ so flag your question and ask to disassociate it from your account... I still stand behind my answer and what you asked is legit. @ShadowWizard Undo's right. I shouldn't use expressions that sound like "I'm on behalf of Charcoal"
@OptimusPrime not in home page, only in questions page. There's big difference between those views, always was. Homepage is quick overview, Questions page has more details. Click SO logo to reach the actual homepage. @ɪʙᴜɢ so.... edit your question? Why delete it? Anyway, the cake is not a lie. I had many cakes since then, but none as good as that one was. If SO will look like Facebook it will cease to exist. Most core users will leave, leaving behind a charred corpse. 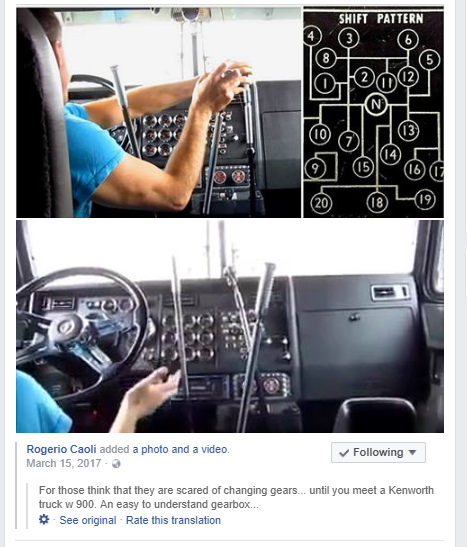 And all those design tests they're doing lately on SO are dangerous.... people start to lose their patience. I am not sure whether SO treated my issue as security vulnerability. If yes, are they still maintaining HoF? No idea what all those three letters shortcuts are, except GUI. When someone is too familiar with something, they automatically assume everyone are familiar with it. They removed the "Hall of Fame" long ago. And it didn't feel pointless? Not even a bit? On Monero, MSE means Monero SE. On Math, it means Math SE. And so on. Still, that's enough for like 6 sites. @OptimusPrime so only Dwarf Fortress players will use the site? Wasn't OP of this question suspended recently? Looks like they're back to their old habits of trolling around. Hope the next suspension is permanent. @MarcGravell Given a big enough hammer, every server can be broken even before connecting it to a power line. I should also reduce my students' grade if they live in a dorm and consistently neglect to flush. Externalities cannot be ignored. @ShadowWizard Well, it's not my decision. If they consider it as a security issue, then I hope they will list it there. Jeremy is in the list. He was a Staff right? @OptimusPrime yeah, around the years listed. Interesting, didn't notice it before. @FTP how you know they neglect to flush? In the past I used to post comments about it, but @Adam made me realize at some point it's doing more harm than good. So I just roll back without commenting about it, which is indeed feeding the troll. I flagged it and asked for them to lock it. There are enough campus gossip sites to know something about everyone. @Catija curious to know when your flag will be handled. After 10 such flags or so I submitted took over a month each to get any attention I stopped flagging on MSE. Also, some of the workers that are allegedly treated badly by Amazon were probably engaging in domestic violence. I say they had it coming. @ShadowWizard All of my recent flags have been handled, actually... I submitted a few moderator comment flags last night... flagged a post that'd been CWed unnecessarily... comments were removed, CW was, too. @Catija on MSE? Nice... maybe it's just me then. Oh well. Yep, just refer to Derpy Hooves page on the MLP wikia. @Catija well, at some point bluefeet told me to stop flagging after I asked what's going on with my flags... too lazy to find it, but it was the last straw. @HTTP Thanks. I had managed to forget Big Rigs existence. Until now. Now that's weird, my answer to the spam/rude flag difference went from -3 to +3 after the question was edited. Not complaining, but wonder if it's related. 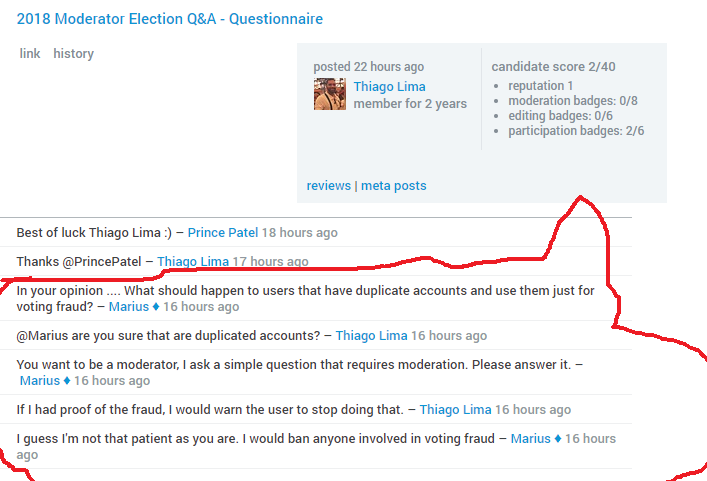 Some time ago a question was posted on Meta about a offensive post being used as a review audit. Cannot find the question anymore. Was it deleted? Can a dev say what happened here please? It is a status-norepro or status-completed. Uhh... should I be worry about SE server being in a quantum state recently? Does @Haney still owns The Stack Snippet editor? I had a wild idea here but that was dismissed. I hoped to relieve some of the need to more regularly update the versions of the offered libraries. How do I explicitly grant write access for a user with less than 20 reputation in a chat room? Um... @AdamLear is "retards" on the single flag delete for comments list? Can it be if not? @Catija No idea off the top of my head. I see/agree with the rationale, but it can also be a verb? Albeit uncommonly used. It can, sure... but I don't know if it'd be likely flagged r/a if it were used that way? I admit that I hadn't thought of that usage.